This week were talking about beef! I’ve got my great friend Julie from White Lights on Wednesday here co-hosting this week! Have y’all ever checked out her blog? She’s pretty stinkin awesome! She’s one of the host of the #GYCO challenge that I love, she hosts a great party on Wednesdays & starting in January she’s going to be starting a blog series y’all aren’t going to want to miss!! Heat oven to 250 degrees F. Season ribs with Sonoran spice mixture. Heat oil in a large, oven-safe dutch oven/braising pan. Sear ribs until golden-brown on all sides; set aside. Add orange halves to pot, face down, and cook until almost black; set aside. Add vegetables to pan and saute until caramelized, stirring frequently. Deglaze with red wine, cooking until wine thickens and scraping up any browned bits from the bottom of the pan. Add remaining ingredients, except butter to pot. 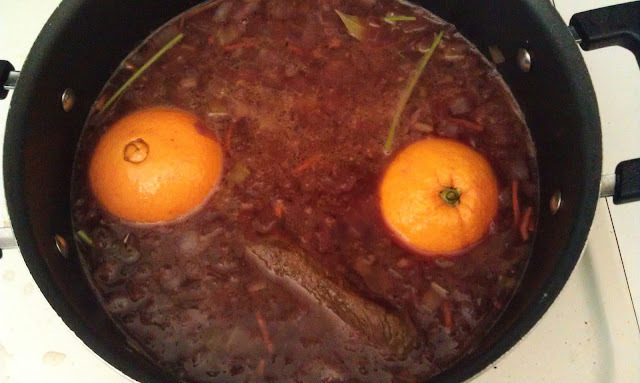 Snuggle ribs and oranges (face down) into the pot. Cover and roast for 6 to 7 hours, until beef is very tender. Remove pot from over and carefully remove ribs from braising liquid. Remove oranges (you don’t need to squeeze them or anything), and strain liquid to remove vegetables. Pour braising liquid back into the pot and cook over medium heat until reduced and slightly thickened. Remove from heat and whisk in butter. Cut ribs in half. Place ribs one plate and drizzle with reduce braising liquid. Sprinkle with fresh thyme leaves. I served these ribs with some roasted new potatoes tossed in a little butter and chives. Remember this week’s theme is Beef Recipes. I love short ribs! They are my favorite beef dish ever. Your sound great and I love root beer, I should try these! Pinning for later. Thanks Melissa! They really are delicious. We had them wil mashed potatoes and Bacon-Corn Relish and put the sauce over the potatoes too. Yum! Thanks for hosting:) Hope you have a super week! Now I am off to pin your short ribs. Thanks for another party! Hope you have a wonderful week! I’m new to your party found you through Storybook Reality. 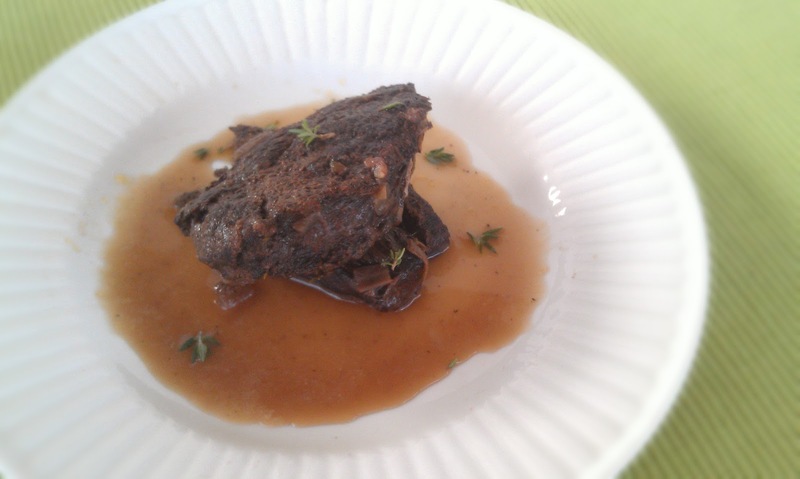 I hope you enjoy my beef daube the French really know how to make cheap beef taste amazing. Thanks for sharing, the ribs look delicious. thank you for having us over for another yummy bloggy party! My hubby would love this short rib recipe! YUM! My Hubs would love them too! Doesn’t Julie’s recipe sound amazing?? !